Help Santa with a makeover for Christmas! Santa and the friends need you to look their best at the Hair Salon & the Christmas Salon!! Featuring fun levels with Santa, Reindeer, Gingerbread, Puppy, Ice Princess and More! Level 1: Help Santa clean-up at the spa! Brush, Shave, Cut and Style Santa's Hair! Level 2: Give Santa a hair salon makeover with fun new colors! Choose the best new style as you color the beard and put in green contacts to finish the look! Level 3: Build a Snow Friend!! Do make-up and don't forget to add the carrot nose or top hat! Level 4: Do make-up & face-painting on the magic winter Ice Princess!! Level 5: Give the Christmas helper a fashionable holiday design! This will look so good for Christmas! Level 6: Christmas Puppy room! Brush the messy hair, wash the puppy with the water sprayer & dry off with a towel. Bark! 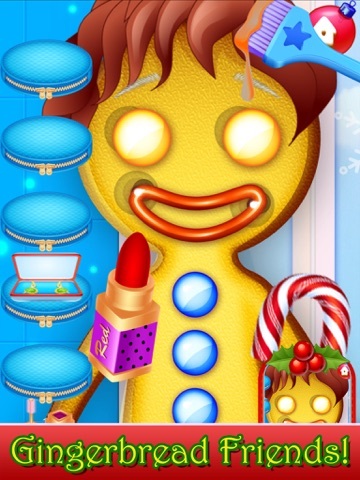 Level 7: Create a Gingerbread design! Add the candy eyes, chocolate hair, frosting and a candy cane to the cookie! 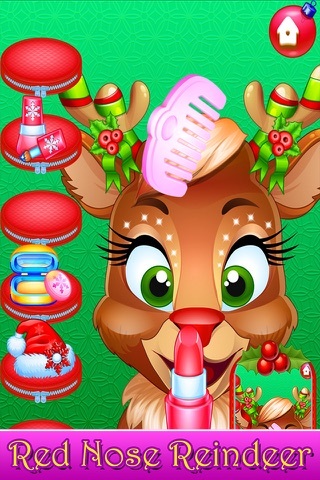 Level 8: Reindeer makeover party! Put on red lipstick, comb the messy hair and get ready for Christmas! *Level 9: Elf Makeover Room -Choose the best hair color for the elf! *Level 10: Santa Christmas Party salon room. Help Santa decorate! *Level 11: Welcome to the Christmas Salon! Get ready at the waiting room, watch a Santa short movie, eat cookies and drink milk! 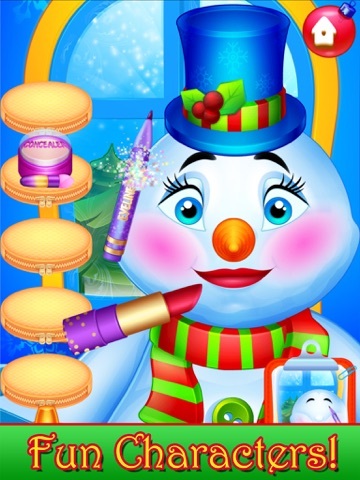 *Level 12: A beautiful new winter fashion and frosty make-up design. *Level 13: Prepare for a new Christmas makeover at the salon. *Level 14: Apply mascara, make-up powder, eye-shadow, lipstick and more. Add diamond earrings! Then get ready for another look. *Level 15: The holiday elf needs your help to get ready for the spa! *Level 16: Give the elf a makeover just in time for Christmas! *Level 17: Snow Princess Salon - get ready for a new winter makeover at the salon. *Level 18: Snow Princess makeover room. Finish the look by putting on a matching jewelry. *Level 19: Ice Queen needs your help with her sparkle make-up! *Please note that levels 9-19 must be purchased separately.